Imixcity Wireless super comfy Sport bras provides a comfortable feeling rather than support. Perfect Pour—Activité à impact moyen et confort toute la journée. ou tout autre sport. C’est aussi un grand farniente, yoga ou un soutien-gorge de loisir et de sommeil aussi. 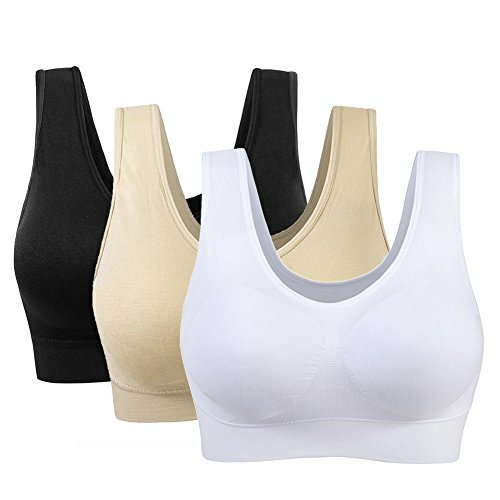 The Comfortable sport bras normally fits for sleeping, lazy-day wearing and sports which are not intense like yoga,jogging ,Running Sportand weight training. Seamless design to minimize chafing,and the Yoke knit with high modulus power stitches to reduce breast movement. The Material of this sport bra are lightweight,super soft,smooth and stretchy. For care:We suggest to remove cups and wash cool,Machine Wash (Hand Wash Recommended).